Best practice: Work on each of your courses for 1 hour per day. This means if you are taking 5 courses, you will work 5 hours per day. This is online time, not time spent working on projects offline. This is the best way for you to stay on track: use the Assignment Calendar. Another tool for completing your course on time is the Activity Schedule. You can use this instead of the 1-hour-per-day method to make sure you do everything required. It should still take you about 1 hour per day. More information on the Assignment Calendar Calculate the number of activities per day. An alternative method for staying on track is to calculate the number of activities to complete per day at the start of the course. If you've already started, you could also calculate the remaining activities and the remaining work days to develop a plan for how many activities you should complete each day. This is a great method to employ if you get behind and want to catch up. You can see that you are behind when you enter a course. The percentage of the course completed is calculated by dividing the number of activities completed by the total number of activities in the course. Your status is then figured based on where you should be in the course in order to complete all of the activities by your target date. When you log in, you will see this information for the selected course. You can view a progress report by clicking on Organizer > Reports > Progress Reports. When you review your grade in Edgenuity, you will see three grades. These are explained below. Actual Grade This percentage represents the grade you have acquired thus far in the course, along with 0s for any work assigned to date but not completed. The Actual Grade is the most accurate grade. Relative Grade This percentage represents the grade you have acquired thus far in the course but includes 0s for ALL work not completed from this point to the end of the course. This is the grade that would appear on the report card if a student does not complete a course 100%. NOTE: If you complete 100% of a course, all three grades — overall, actual, and relative — should be the same. 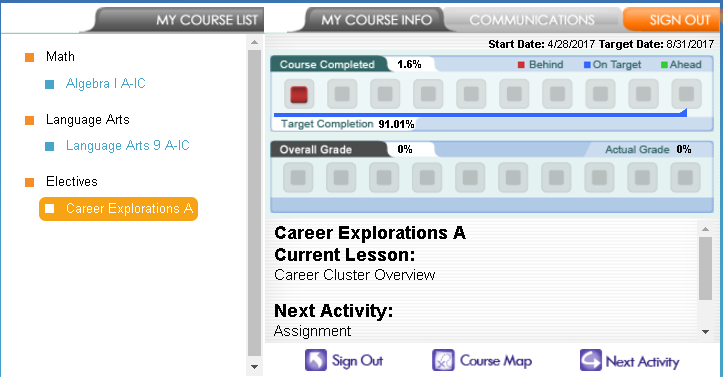 Overall Grade This percentage represents the grade your student has acquired thus far in the course, based on all activities and assessments completed. This gives a good indication of how the student is comprehending the material; however, it can be deceiving if the student is behind pace because this grade will be higher than the actual grade. The Actual Grade is the most accurate grade. If you are behind on your pacing for a course, your relative and overall grade will be affected. What if I want to work on one course at a time? This practice is not encouraged, but we will provide the flexibility for students to work on courses this way. Students will be required to work 5 hours of online time a day on one course and demonstrate acceptable progress toward the Target Date. All semester courses must still be completed by the semester Target Date. ELITE STUDENTS should let their Edgenuity teachers know of their plans to work on one course at a time and request a waiver for alerts from other course teachers.